NEELKANTH offers partition slotting machine for inner partition in a corrugated box. We offer an exclusive series of Partition Slotter Machine to our customers. These are made by expert’s team as per industry norms and parameters. Partition Slotting Machine is designed to slot a number of board sheets at a time with slotting knives. Standard models has 6 nos. of slotting knives. Additional slotting knives can be provided on request. OPTIONALS : ADDITIONAL SLOTTING KNIVES. 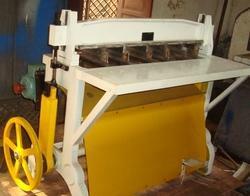 This machine is capable of slotting a number of sheets at a time. Adjustable slot dies are mounted on a support. The machine has a simple design. Machine Size: 32"	to 44"
Floor Space: 30" x 62"
We are offering Partition Slotting Machine to our client.